Navy and white pinstripes are the awareness colors for ALS (Amyotrophic Lateral Sclerosis). This condition is also known as Lou Gehrig’s Disease. 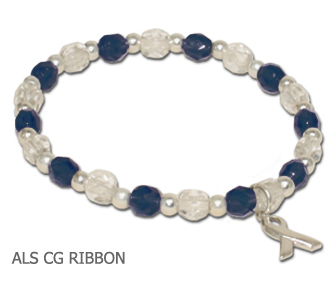 Transparent navy blue and clear faceted beads with an Awareness ribbon charm on jeweler’s elastic. Available in sterling silver or silver plate. 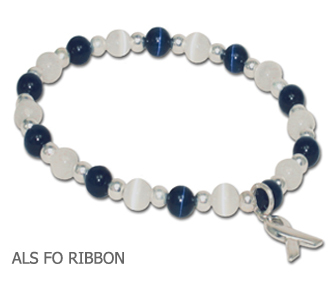 Opaque fiber optic navy blue and white beads with an Awareness ribbon charm on jeweler’s elastic. Available in sterling silver or silver plate. 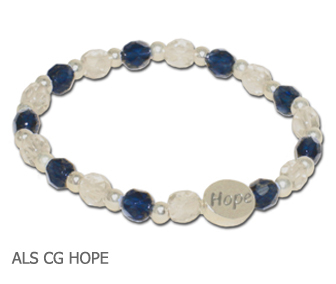 Transparent navy blue and clear faceted beads with a Hope bead on jeweler’s elastic. Available in sterling silver or silver plate and pewter bead. 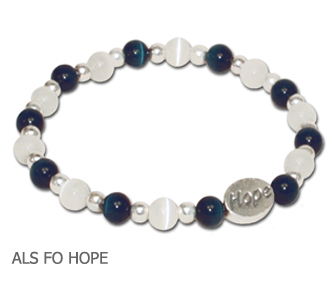 Opaque fiber optic navy blue and white beads with a Hope bead on jeweler’s elastic. Available in sterling silver or silver plate with pewter bead.